André Hahn hopes to regain scoring form in front of a partisan crowd at the Borussia-Park in Mönchengladbach on Saturday. Hahn also talked about his style of play, league leaders FC Bayern München, coming opponents Hamburger SV, and football’s nascent renaissance of the centre forward. 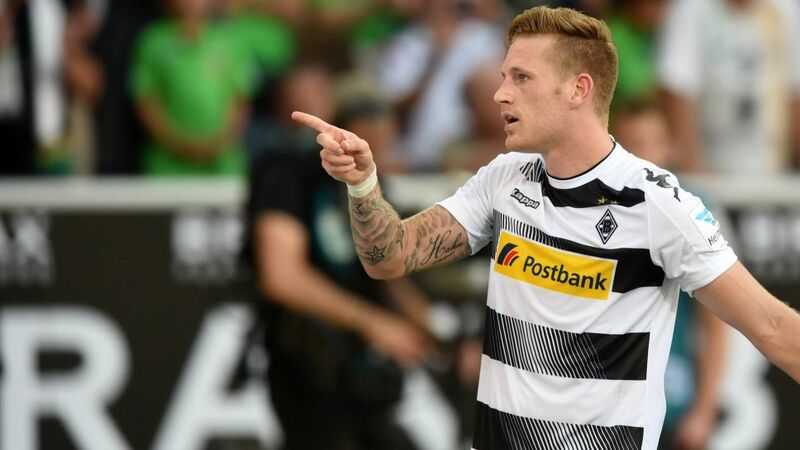 Head here to sign Andre Hahn for your Official Fantasy Bundesliga side! bundesliga.com: Mr. Hahn, a very wobbly Hamburg are coming to the Borussia-Park - they’re in last place and have taken only one point so far this season. How does a coach and a team prepare for a game like that without subconsciously underestimating their opponent? André Hahn: We’re going into this game like we do any other. That means we won’t underestimate HSV any more than we did SV Werder Bremen a few weeks ago, and they were in a tough situation themselves then. After six match days, the table can’t tell you all that much about the tactical quality of a team. But it is clear Hamburg are under pressure here - they need to get a result. But we’re playing in Borussia-Park, and it’s no secret we’re a real powerhouse at home. "We certainly don’t have a fundamental problem in defence." bundesliga.com: HSV have a new coach in Markus Gisdol. As an opposing player, do you think about what effect that might have on a game, or is that sort of a side issue to you? Hahn: Of course we’re aware of it and we all know from experience that a coaching change gives players a chance to prove themselves and show what they have to offer. It’s a motivating factor, it fires players up. But for us that kind of news is a side issue, because it’s never going to matter to us that much how our opponent wants to play. It’s always our goal to play our game, and play attractive football. And we have a bit to put right after losing 4-0 at FC Schalke 04. "I’m a centre forward now, and I understand that a centre forward is judged by his goals." Hahn: That’s true. In the past two years I’ve not lost against Bayern (laughs). And last season I managed to score to put the game level at on and get us a 1-1 draw there. We know we’re a team who can give Bayern problems. bundesliga.com: Do you notice a difference yet between the Guardiola- and the Ancelotti-Bayern? Hahn: I’ve not watched a Bayern game from start to finish this year yet. In that sense it’s hard for me to pass judgement. What I hear from colleagues, and from the media, seems to tell me that you can recognise Ancelotti’s signature on the team. At the moment I’m not giving that any thought. I’m sure our coach will have done his analysis and be ready to show us all we need to know. bundesliga.com: Your goal against Bayern was one of six you scored in a run of five games, going back into last season. Since that win over Leverkusen on matchday one, you haven’t scored since. How come? Hahn: I’m a centre forward now, and I understand that a centre forward is judged by his goals - particularly when you’re coming off a hot streak. If you don’t score for four games and you don’t get as much playing time, it’s normal to get a bit of criticism. I’m pretty sure I didn’t have my best game against Schalke either. Still, I’m not worried and am far from being a player in crisis. Whenever I play I try to work as hard as I can for the team. And in training I go all out to prove I belong in the starting line-up. That’s in my nature. We have a lot of quality up front. But I think I have a lot of quality myself, and I think I’ve shown that. I’m convinced that will shine through once I get another goal. Once I get one, more will follow.